Wow- that looks all kinds of awesome buddy!!! So SW4 same size as NV? Ok - check this out. That glass on the right is too square and the sides are too thick. Yea, that's what I thought too! I knew I'd seen bases like that. They're not common on glasses, but they are common on candle holders. Cant figure out if this is being made by the guy who did the original or if this is a crafty person who identified the found knife. Not sure why the knife maker would partner with someone making shoddy 3d printed replicas and selling found items identified on the RPF. Since the guy that did the one in the film was asking for $6,000 for the same knife, I am assuming it is someone else. Not sure if this person has his blessing or how he was able to scan the original. EDIT: bottle.is quite thick isn't it? Perhaps a little too thick. I can now confirm that the person making this is working with the person who made the knife in the film. Remains to be seen how good the quality is. It's definitely thick glass and I'm not sure about the depth of the bottle. I'm going to see if I can find some pics of the bottle out "in the real world". Yes, it's an expensive gin but will provide, hopefully, some pleasant evenings as I endeavour to empty the contents. I'm genuinely surprised that this is the case. You'd think the original artist wouldn't want to be associated with , what appear on the surface to be, knock offs. I tend to agree with you. The owner of the Etsy site told me, "Ron Best made the prototype Knife I have photos of and it is a manual opening knife because we cannot market a switchblade." Not sure what their agreement is from here on out. 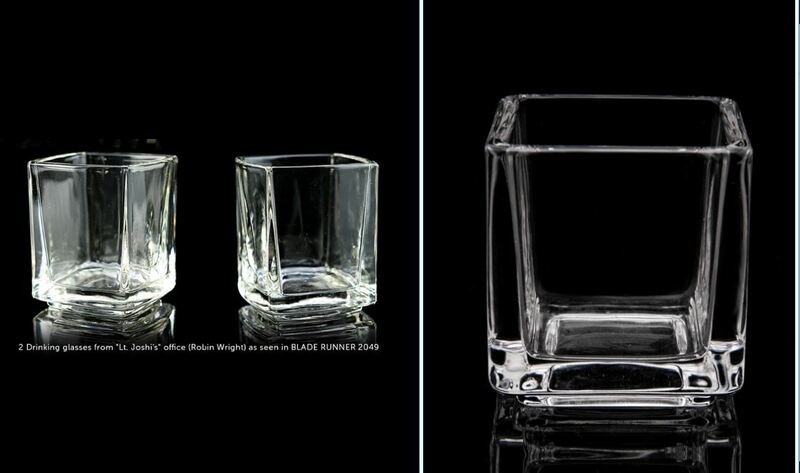 Collektor (on the RPF) has posted a glass design that's similar to the new bottle. Check it on Amazon.com : joyjolt scotch whiskey glasses. I'm looking, but not finding anything that looks like the glasses in 2049? You've done a man's job sir! You got a response from them?? I think I emailed them with little success!! Just strikes me as odd the bottle doesn't seem to exist, as the others were all pretty easy to find! You've done a man's work sir! Ya got a reply from their UK person in charge. The rep at Vetroelite identified the Genny 500ml in the pic of K's bottles. If it's just the 500 we want that should help to reduce costs a bit since they already produce that regularly. Are you going to be our distributor white43? I'll compare the bottles, they also do the 750ml regularly, but don't advertise it. I am already working on a sticker/transfer for the bottle symbols. Wow you have better luck than me, can't wait to see pictures for comparison. I would love to get 4 of them, maybe a few more if my friends are interested.